Located at the heart of Hong Kong’s premier shopping and entertainment district, the contemporary Park Hotel Hong Kong offers an ideal choice for travellers where guestrooms feature the contemporary concept coupled with modern amenities. In order to bring the guests very best travel services, the hotel has equipped all 347 modern guestrooms with a complimentary smartphone for guests to elevate the staying experience and enjoy unrivalled convenience and seamless connectivity. Catering to all needs and preferences, Park Hotel Hong Kong has integrated the innovative handy smartphone in all luxurious guestrooms and suites since February 2015. During which, the hotel has received consistently positive feedback about this value-added service from guests. 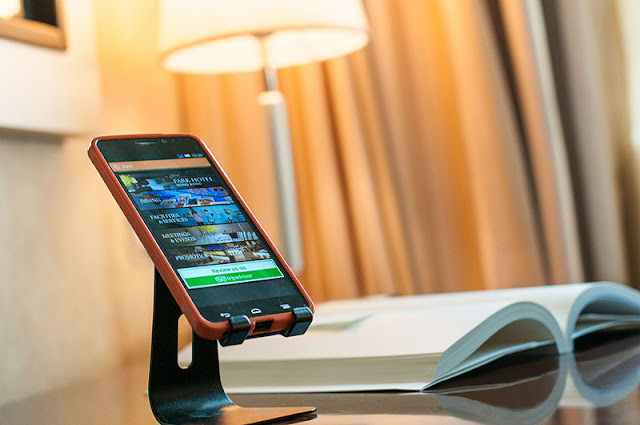 Each personalized handy smartphone is available for guests as they enter their guestrooms, giving them instant access to free unlimited local and international phone calls and complimentary high-speed data connectivity. From March 2016 onwards, we have extended the international call list up to 10 countries – including popular destinations such as Australia, China, India, Japan, Singapore, South Korea, Taiwan, Thailand, UK and USA. The hotel also endeavours to be seamlessly connected to its guests. With the unlimited 3G Internet connectivity, for guests-on-the-go, they can take the handy out of the hotel to stay connected during the day. In addition, the handy in-room solution is pre-loaded with useful travel apps, including news services, Hong Kong city guide as well as a host of exciting discounts across Hong Kong. With dozens of helpful articles and travel tips written by an expert team of local Hong Kong editors, travellers will have their fingers on the pulse, allowing them to discover the best that Hong Kong has to offer. Upon check-out, all browsing history, personal information and any additional applications are completely deleted from the device, and the handy is reset to the original factory settings. This ensures peace of mind for the user, while upholding Park Hotel Hong Kong’s dedication to safeguarding guest privacy. Park Hotel Hong Kong is in constant pursuit of excellence with every facet of our products and services. Installed with the latest technology, the guestrooms of Park Hotel Hong Kong provide the maximum comfort for both leisure getaway and business trip. With the spectacular view of the bustling night scene and easy access transportation networks, the hotel offers you the most convenient way to explore this vibrant city.